Welcome to the new world-class facility in the City of Angeles! 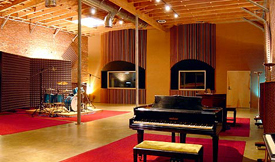 When it comes to studios "built by musician for musicians," Bomb Shelter Studios is the latest of world-class facilities created to satisfy the most discriminating recording artist or producer/engineer. 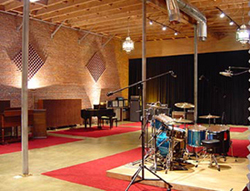 Ex-Stone Temple Pilot drummer Eric Kretz has opened Bomb Shelter Studios in loft-hip downtown Los Angeles. The tracking rooms features 16 ft. ceilings with 100-year old brick walls, large enough for recording a 44-piece Orchestra, and offers an amazingly spacious Drum Room -- over 60' of mic distance. Attached to the main room are three separate large ISO rooms suitable for vocals or any type of overdubbing. The control room houses an SSL 4048 G+ and a full-blown ProTools HD2 w/ 48 I/O with all the latest Pro Plug Ins. 2 Cent Penny produced and mixed by Kretz. Add to this Classic out board gear to include NEVE, Pultec, dbx, etc... and modern staples such as Empirical Labs, Tube Tech, Summit Audio, T.C. Electronics, Lexicon... and you've got an engineer's toy store. Studio Monitors: KRK, Tannoy, Yamaha, Aratone.